MOORE, Okla. - Police say a woman who was killed by a co-worker at a food distribution center in suburban Oklahoma City was beheaded and that witnesses have said the suspect had been trying to convince co-workers to convert to Islam. But authorities say the killing was motivated by the suspect's firing, rather than any pre-planned act of terror. Moore Police Sgt. 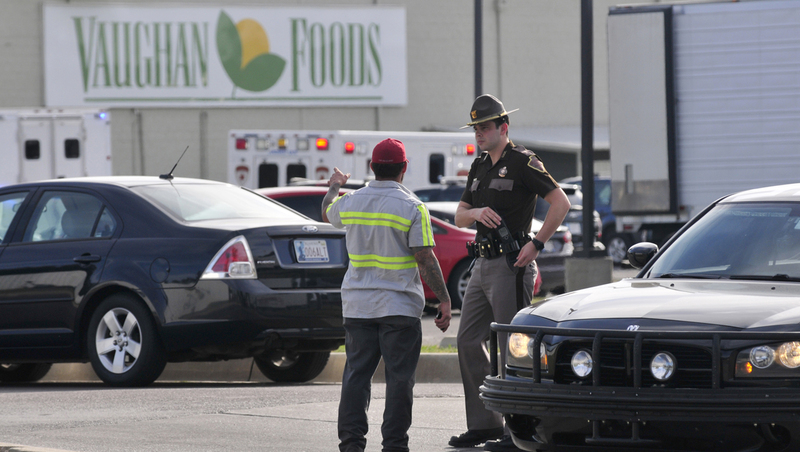 Jeremy Lewis said Friday that 30-year-old Alton Nolen had been terminated from Vaughan Foods in Moore, where he worked as a production line employee, shortly before the incident took place on Thursday afternoon. Lewis said Nolen exited the building after being fired and went to the parking lot where he drove his vehicle to the front of the business and hit another car. Nolen then walked into the front office and began attacking a woman with a standard knife used in the business, Lewis said. Colleen Hufford, 54, was beheaded and another woman, 43-year-old Traci Johnson, was stabbed. Both victims were employees of Vaughan Foods, but according to Lewis, it appeared the women were not targeted and were instead stabbed at random. Mark Vaughn, an off-duty officer who also serves as chief operating officer of the business, shot Nolen as he was stabbing Johnson. Sgt. Lewis touted Vaughn as a hero Friday and said he saved Johnson's life. "It could have gotten a lot worse. This guy wasn't going to stop," said Lewis. Johnson and Nolen were still hospitalized Friday and were said to be in stable condition. According to Lewis, statements were made to investigators that Nolen had recently converted to Islam and had been trying to convince employees to convert to as well. It is unclear whether this is why Nolen had been terminated from the business. Police were called about 4:15 p.m. to reports of a fight inside Vaughan Foods. Lewis says officers were told that there had been a stabbing and shooting. The FBI is involved in the investigation and is currently conducting a background investigation into Nolen, Lewis said. The Department of Corrections describes Nolen as having several tattoos, including a picture of Jesus Christ on his chest, praying hands on his arm and an inscription on his abdomen that says, "As-Salaamu Ataikum," an Arabic greeting often used by Muslims translating to, "Peace be upon you."